Many industries, data centers, manufacturing processes, and product storage criteria demand tight environmental controls. In addition to thermal control, Coolstructures panels give designers, contractors, and owners the ability to control dust, moisture, mold, and acoustic environments; and the selection of colors and surfaces can make it easier to control lighting. For example, a temperature-controlled pharmaceutical storage room for containing temperature sensitive pharmaceutical substances must be maintained within a range of temperatures to avoid diminishment of potency or shelf life. The Medicines and Healthcare Produces Regulatory Agency (MHRA) reports that temperature rises above desired parameters are the number one critical deficiency in pharmaceutical warehouses. It is not the general conditions that affect product quality, but extremes of temperature within the operational space. Coolstructures environmental control Metal SIP panels are a variant of our standard structural insulated panels so provide comparable structural and thermal attributes. Yet they are designed and manufactured with laminates and coatings that that have smooth surfaces, do not collect contaminates, are resistant to mold and corrosion, and withstand frequent washdowns. Plastisol and stainless steel are common skins over the insulation. Additionally, Coolstructures panel joining system optimizes the seams to minimize cracks where dirt or contamination can collect. Over the past 20 years, Coolstructures has developed an advanced insulated building panel system with high "R" values. These clean room metal or FRP SIPS offer unsurpassed thermal efficiency, they are easy to install and offer the lowest cost per "R"of any similar panel product. With Coolstructures panel products you save $ today and tomorrow. Coolstructures EPS panels are manufactured in a variety of thicknesses between 2 inches and 12 inches. The different spans allow for the specific R-Values and K-Values needed for your application. Coolstructures continuous laminating line can manufacture panels in any desired length and to each jobs specific tolerance needs. 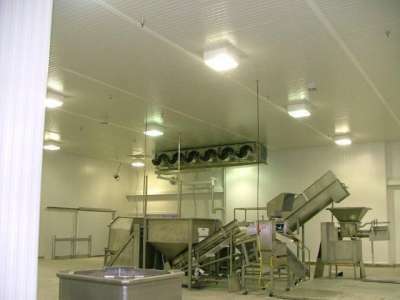 Applications include walk-in coolers/freezers, cold storage warehouses, food processing and storage, floral storage and transportation, pharmaceutical, and similar rooms or buildings where cleanliness is a must. Whether walls, floor, or roof insulated panels are required, Coolstructures can provide the ideal customized solution.